← When You Think of USA Hockey…. When you think of USA Hockey, what current player comes to mind first? 1. Ryan Miller; 2. Zach Parise; 3. Patrick Kane; 4. Ryan Kesler T-5. Bobby Ryan and John Carlson; 6. Jack Campbell; T-8. Mike Modano, Jack Johnson and David Backes; T-11. Ryan Malone, Rocco Grimaldi and Julie Chu. A pretty wide range of players, from a variety of places. I was intrigued with the responses I received. 1. Tim Gleason (Apparently I have a few very influential Hurricanes followers); T-2. Ryan Miller and David Backes; 4. Patrick Kane; T-5. Zach Parise, Ryan Kesler and Jack Johnson. The second question was more for fun, and produced a wide array of answers, which was great to see. However, the first question was the one I really wanted to know. The results were right about where I thought they’d be for my first question. I knew the answers would be different than mine, for the most part. There were only a handful of people that have the same choice as me. 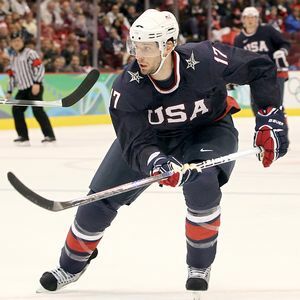 The player that I currently most identify with USA Hockey is Vancouver Canucks forward, Ryan Kesler. The Olympics helped Kesler gain some new notoriety, but he did not achieve the stardom that Ryan Miller and Zach Parise did coming out of the 2010 Winter Games. Patrick Kane, a first overall draft pick and fellow Olympian, scored the Stanley Cup-winning goal thus making him a household name. So it was no surprise to me that those three would be high on everyone’s lists. Since he plays in Vancouver, he’s sometimes out of sight, out of mind for American hockey fans, which is too bad. He really is a lot of fun to watch. His star has risen a little bit over the last two or so years. Kesler appeared on the cover of the NHL 2K11 video game, with little to no fanfare. He’s been a finalist for the Selke Trophy, given to the NHL’s best defensive forward, for the last two years, but that’s not exactly star-making material. Now that Kesler is in the middle of an All-Star season, in what looks to be a career year, he’s starting to get a little bit more notoriety. So needless to say, I was more than pleased to see Puck Daddy’s Sean Leahy write a great piece yesterday about Kesler being a dark-horse candidate for the Hart Trophy. I completely agree with Leahy’s points on why Kesler deserves consideration for the NHL’s most prestigious individual award. He’s probably still a long shot, but its nice to see I’m not the only one that thinks he’s becoming one of the league’s elite players. First and foremost, he may be one of the most complete players in the league right now. Sure, he’s one of the best defensive forwards in the NHL today (career plus-27 rating), but he can score too, with 20-plus goals in each of the last four seasons. Then add to that his heart, grit, toughness, and speed and you’ve got a guy any team would want to have. His empty net goal against Canada in the preliminary round of the Olympics kind of symbolizes the way he plays (As also pointed out by Chuck in the comments yesterday). He’s pure hustle (and not the David Eckstein kind…). Another big factor for my selection of Kesler is it seems he only gets better with every year he’s in the league. Last year brought a career-best 75 points for him and he’s looking like he’s certain to top that this year. Like hockey in this country, he’s been on a steady rise and may have finally found out what type of player he’s supposed to be (Story via Leahy). He’s a leader for the Canucks both statistically and in the dressing room as an alternate captain. Sure Vancouver has the Sedins and Luongo, but I still think they’d be a much different team without Ryan Kesler. When the U.S. Olympic team was chosen, I’m guessing that Ryan Kesler’s name was one of, if not, the first Brian Burke scrawled out on his roster sheet. When Burke and head coach Ron Wilson spoke of Kesler in pre-tournament press conferences, words like warrior and toughness were bandied about (can’t recall if truculence was uttered). “I hated playing against him, that’s for sure,” added defenseman Erik Johnson, a teammate of Backes’ on the St. Louis Blues. “He’s a guy that I think you’d love to have on your team and hate to play against. I think on that empty-net goal against Canada you see the effort he brings, and that’s not the only play, that’s just kind of maybe what’s to top it all off of how he’s played so far. He’s such a great guy to play with and a guy I’m not going to want to play against when this tournament ends,” Johnson said. Kesler is the type of player that’s going to help leave a mark on the game in this country. With a mixture of toughness and skill, and occasionally playing with a chip on his shoulder, Kesler reminds me of where we are as a hockey country. The U.S. has come a long way in the last decade even, as far as producing talent. Kesler kind of embodies where we’ve been, where we are now and where we can be. He’s got a little bit of old school in him, but has adapted to make it work in the modern NHL. On top of that, he’s found his balance. He’s been great defensively in a league that is trying its hardest to promote offense. Conversely, he’s got enough firepower to be among the league’s top point producers. There are very few that can be good at both. The other great thing about Kesler? He’s been wearing the USA jersey since he was 16 years old, starting at the National Team Development Program. He was part of the the country’s vaunted 1984 birth year that produced players like Zach Parise, David Booth, Matt Carle, Patrick O’Sullivan, Patrick Eaves, Mark Stuart, James Wisniewski and Jimmy Howard. That group won the first gold medal for the U.S. at the World Under-18 Championship in 2002. It was the first of a tournament record five the U.S. has now claimed. Two years later, Kesler was a leader on the U.S. National Junior Team that earned the first ever World Junior Championship gold medal for the United States. So in a way, he’s been a bit of a pioneer. Along with guys like Parise and Ryan Suter, Kesler was part of a group that showed American players that they can hang with anybody. It was really the 1984 and 85 birth years that helped begin to build the tradition of winning on the international stage, which has been recently replicated at both the U18 and Junior levels. That whole team fought and clawed to try and get that gold medal. Kesler took it awfully hard when they came up short. Which brings me to my final point about what makes me think of him when I think of American hockey: competitiveness. As Americans, we love to win, but I have a feeling we hate to lose more. Of all the things Kesler does, it’s his competitiveness that separates him from many of his peers. There’s no quit in his game. Perhaps that’s why he continues to get better. Like hockey in this country, Kesler doesn’t just want to be better. He needs to be better. USA Hockey doesn’t just want to win gold medals, and put more players in the NHL. It needs to. There’s a reason for initiatives like the American Development Model and the NTDP. The need to be better is the driving force in where hockey in this country is going. So that’s it. Ryan Kesler is one of the current NHL players I admire most (My apologies to all of my fellow Blackhawks fans, please don’t throw me out of the club). He’s come a long way in a short amount of time and I don’t even think we’ve seen his best just yet. Since he is like the mirror image of what the American game should be, he’s the first guy I’ll think of when I think of USA Hockey. Zach Parise – Parise represents the exuberance and pride of the American game. He’s represented his country on numerous occasions and has had great success. His goal against Canada to force overtime will forever remain one of the greatest goals in USA Hockey history. The look on his face after that puck went in punctuated the moment. Ryan Miller – The goaltender that just about stole gold for the U.S. He’s a former Hobey Baker winner, he’s got a Vezina Trophy and he plays in hockey-mad Buffalo. Like Mike Richter before him, Miller has become a catalyst for Team USA’s recent international success. USA Hockey has to be pleased with the rising popularity of its finest American goaltender. Jack Johnson – This guy has never said no to playing on a U.S. National Team. Heck, he chartered a flight to go to the opening ceremonies of the Olympics, just to be there. Just to be part of it. In April, Johnson was the only U.S. Olympian who also played at the IIHF World Men’s Championship in Germany. Why? Because USA Hockey asked. A strong, physical defenseman with offensive ability, he’ll continue to be in the forefront of the American hockey fan’s mind. Even more so now that he’s been given an extension in LA. Patrick Kane – Kane represents the youth movement. There’s a whole heck of a lot of players coming up behind him. His Stanley Cup-winning goal solidified him as a hockey star. He’s only the second American to have won the Calder Trophy as the league’s top rookie and he plays in one of the largest media markets in the nation. The sky’s the limit for this former first-overall draft pick. Ryan Suter – Steady. You might not notice him all the time, but he may be the very finest American defenseman playing the game right now. He’s played on so many U.S. National Teams and has always been ready to go when needed. He’s still young, so expect to hear much more from Ryan Suter for years to come. There are so many great players coming up through the ranks. The game in this country isn’t even close to peaking when it comes to developing talent. As good as it is now, the best is yet to come. Thanks again to everyone who responded via Twitter and the blog! If you’ve got more thoughts on this topic, feel free to leave them in the comments here. This entry was posted in NHL, U.S. National Teams. Bookmark the permalink.